Music is at the heart of worship. It is one of the most beautiful forms of prayer. Whether we sing in a group or just listen, music touches all of us in a deep and meaningful way. We can express our love, joy, and even our sorrow through music. Our mission is to serve God through inspiring music that touches people’s hearts deeply with God’s love, wisdom, and healing. Come join us in song! Listen to us here. If you like to sing or play an instrument please consider sharing your gifts with our Music Ministry by contacting our Music Director, Linda Donaldson. The Adult Choir for the 10 AM Mass rehearses on Wednesday evenings from 7:30 p.m. - 8:30 p.m. The Adult Choir for the 5 PM Saturday Mass rehearses on Thursdays from 7:30 p.m. - 8:30 p.m.
CHS Childrens' Choir rehearses Wednesday evenings from 6:00 p.m. - 6:45 p.m. during the school year, September through May. Our for 2018-2019 schedule is here. 12:00 p.m. Coro en Español, practica los domingos antes la misa a las 11:15 a.m.
Our Adult Sunday 10 a.m. Choir is a large group of singers, piano, guitars, bass, flute, clarinet, keyboard and drums. We sing and play a variety of music. This group rehearses on Wednesday or Thursday evenings from 7:30 - 8:30 p.m. Members only need to attend one of those rehearsals. 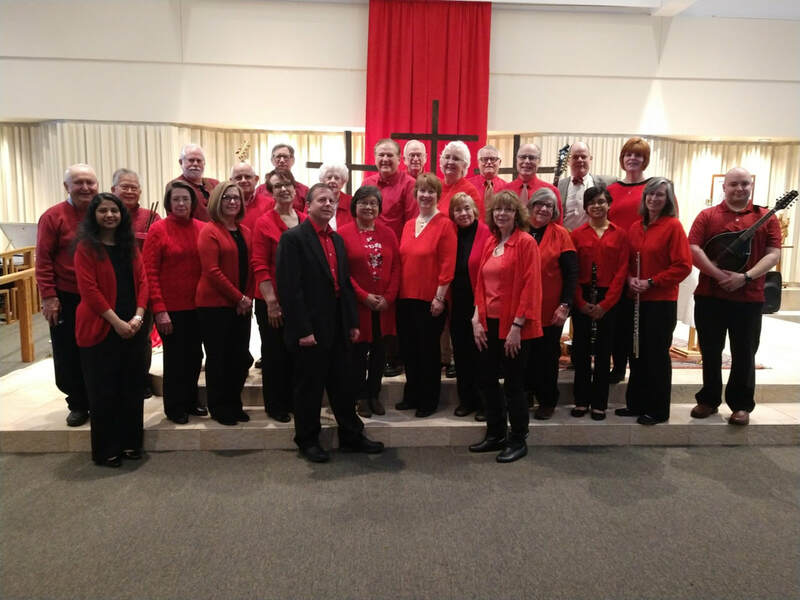 Our Adult Saturday 5:00 p.m.Choir is a smaller group of singers with piano, bass & guitar. We are looking for more members to join! This group rehearses on Thursday evening from 7:30 - 8:30 p.m.
Nuestro coro en español está compuesto de un grupo de cantantes y muchos músicos. Hay guitarristas, violinistas, mandolinas, baterista, tecladista y pianista. Ensayamos los domingos de las 11:15am a las 12pm y celebramos la misa del mediodía. The CHS Childrens' Choir is open to children that are 5 years old through 12 years old in the fall of 2017. We rehearse on Wednesday evenings from 6:00-6:45 p.m. in the Kane Center Music Room. Your child will learn to read music, play hand bells and percussion instruments and sing in different languages. 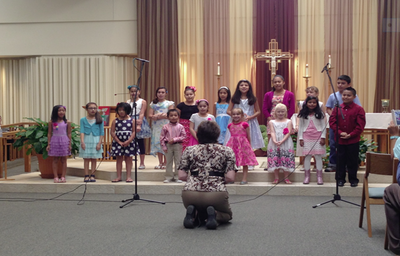 The CHS Childrens' Choir will sing at different masses throughout the school year from September through May. If you are interested in having your child join the choir, please fill out the registration form in English or in Spanish and return it to the Parish Office, Attn: Linda Donaldson. If you would like a copy of our rehearsal and performance schedule please click here.